This great 1 bedroom 1 bath condo is located right on Main Ave. in Historic Downtown Durango in Nobody's Inn. Walk to restaurants, galleries and shopping. Sleeps 4 comfortably on a King size bed in the bedroom and a full size sleeper sofa in the living room. Fully equipped kitchen. Nobody's Inn is actually four condos on Main Avenue with a common hall but with private rooms and baths. 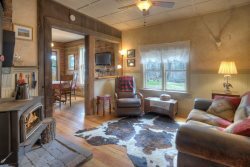 This quaint setting is perfect for travelers who prefer to be self sufficient and private, while still being close to all of the amenities that downtown Durango has to offer. While Inn staff is seen on site daily, Nobody's Inn is self check-in and check-out. Very similar to hotel styled atmosphere, but for guests, it's more like renting individual vacation condos. One nights stay due on completion of reservation. Balance is due on day of check in. Check in 4pm. Check out 11am.